Enjoy time on the beautiful beach by Hotel Riu Caribe. If you are planning a trip to Mexico, you may want to consider the reviews for Hotel Riu Caribe in Cancun Mexico. The reviews will help you know what to expect and whether or not the Hotel Riu Caribe is for you and those you will be traveling with. The Hotel Riu Caribe, a nine-story, five-star resort hotel, is located on the Yucatan Peninsula in coastal Cancun. The Caribbean Ocean greets you with its sparkling and clear warm waters. To get to Cancun, you can make your travel arrangements through a travel agent and he or she may have some inexpensive flights for you. Depending on when you can travel, will determine the cost of your flights. 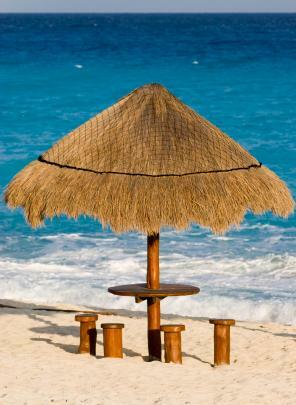 Remember, it is always warm in Cancun, even if your hometown is covered with snow. There is a wide selection of restaurants to choose from. Sightseeing from the hotel is easy. An all inclusive package of sports, entertainment and dining makes this resort ideal for families or couples to experience a wonderful getaway. You may go online to find out the cost of this package or ask your travel agent. Tripadvisor boasts over 1500 review for this lovely hotel, and is viewed as excellent for a range of ages and travel interests. Debbie's Caribbean Resort Reviews: Various reviews and notes on specific details of the Riu Caribe. Book It offers a substantial overview of the resort and full color photographs. Prior to your vacation away, you may want to brush up on your Spanish or learn a few helpful phrases. Although the hotel staff can assist you in English, it is always good to try your hand at learning the language of the country you plan to visit. What a great opportunity for you!Happy conversing and safe travels!